We are here to photograph backstage at the luxury Peninsula Hotel in Paris. 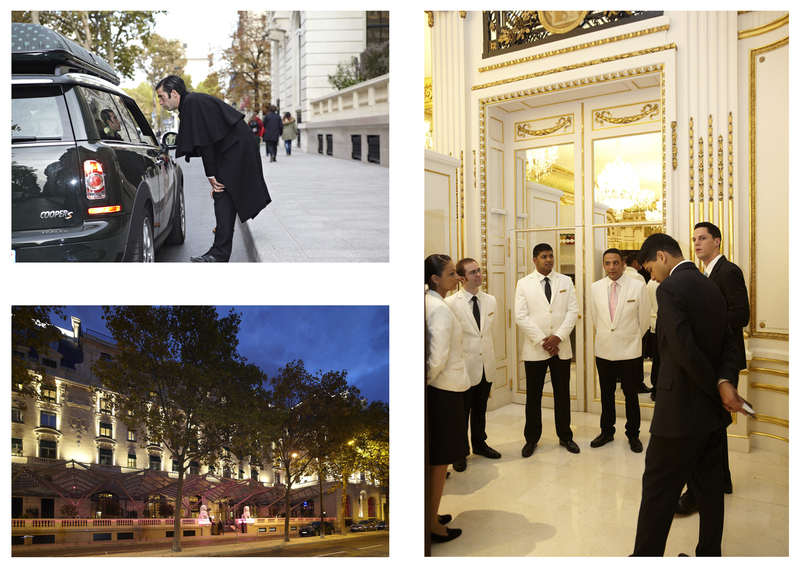 600 enormously commited people are employed to look after guests. 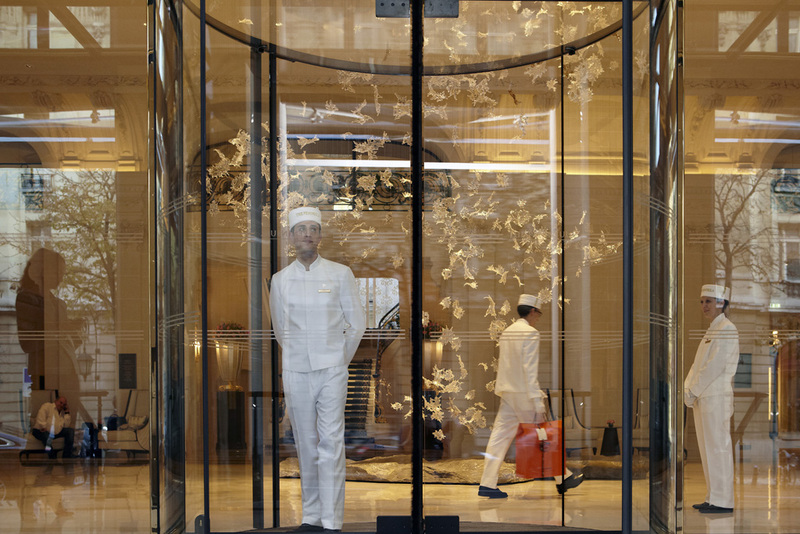 Everyone knows your name, from the porter to the manager, which is common practice in all of the Peninsula hotels – good old-fashioned politeness. Every morning, the names of new guests are revealed at the morning roll call. It takes some doing as the many Arabic and Russian names aren’t easily remembered – and then there’s the various titles. How do you address a Crown Prince from a deposed monarchy, officially his title has been stripped but he still continues to use it himself? The head of hospitality conducts his research thoroughly to make sure the rules of etiquette are observed. To transform the original Hotel Majestic in Paris took an enormous amount of work by experts. Its restoration took four years, specialist gold leaf restorers used 40,000 sheets of gold leaf and the four man-sized curtain tassels in the Lili restaurant involved 600 man-hours and 15 kilos of silk to create. Each of the 200 rooms needed two and a half kilometres of cabling to operate of the state of the art equipment (the distance between Amsterdam and Paris!) The lift is very entertaining, with a voice stating your level of arrival in several languages with appropriate accents. The Hong Kong Kadoorie family, owners of the Peninsula chain of hotels which was established in 1928 saw the cost of acquiring and renovating the Hotel Majestic spiralling to the tune of 895 million euros. With the most reasonable room costing close to €1000 a night, rising to anything up to € 25,000 for the most expensive suites its frequented by the rich and famous. In fact there is such demand in Paris that there are now three more hotels in the same price tier as the Peninsula: Raffles, Mandarin Oriental and Shangri-La. The Asian/Chinese travel market is worth something in the order of 300 million euros per year and as a result the old-established & famous Parisian hotels such as The Ritz and George V have been spending huge amounts of euros in an attempt to stay in the race to attract these high-end, well-heeled travellers. So, what does a thousand euros get you? Free internet (a normal feature in cheap hotels, but oddly enough a rare commodity in the more upmarket ones), a free mini-bar of soft drinks , an enormous crystal wall to slide to one side if you want to watch television, an electric nail dryer. A mood button in the bathroom instantly dims the oval black marble space into a dusky shade of violet light, while a starry sky filled with dozens of LED lights appears in the ceiling accompanied by Richard Clayderman from the concealed speakers. There is also a Boîte Valet incorporated in the wall: a kind of dumb waiter between the room and the corridor, so that you can take a room service delivery without being disturbed by the staff. In 1973 the treaty that would bring an end to the Vietnam War was signed by Henry Kissinger among others in what is now the Kléber Bar; now home to the sound of the bar tender shaking and stirring cocktails for guests. 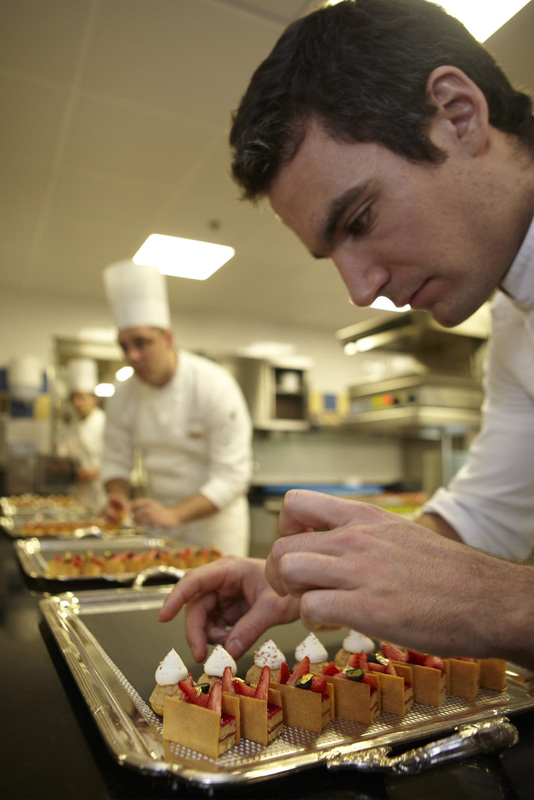 Julien Alvarez and his team of eleven staff are working frantically on the minute petits fours, decorated with gold leaf and devoured in a single bite. Smoking is possible in the cigar lounge, an enclosed space filled with crystal and cherubs floating from the ceiling and a home telephone for the waiting staff. Order coffee and sometime later the phone rings to tell you the coffee is waiting in the hatch. The large cleaning staff working at 6am scrubbing and vacuuming the outside patio area. According to ancient Chinese custom the two huge Chinese lions on either side of the entrance protect all those within the building. However, in today’s world this old tradition can’t be relied on – the Peninsula employs a large team of security staff who listen attentively to their ear buds and watch their surroundings like hawks. A rather scruffy woman arrives but is stopped by a courteous security man. After consulting with reception and very little fuss she is identified and not long afterwards is having her breakfast of a salmon omelette, homemade chocolate croissants and a glass of champagne. The security guards learnt a useful lesson that appearances can be deceiving but handled the whole matter as experts. In the catacombs of the hotel, the flowers arrive; fresh from the Netherlands every day. The Peninsula rose is a soft pink with a darker heart. Today the hotel florist feels that on inspection the heart isn’t quite dark enough, she will have to talk to the supplier. Throughout the hotel everything must be 110% for the staff to be satisfied. Xavier Thuizat, the chief sommelier, had the enviable job of stocking the new hotel’s wine cellar with an unlimited budget! Famous names like Pétrus, Romanée Conti, Rothschilds, Meursault, Krug Grande Cuvée are all there. At the moment he is selecting hundreds of bottles of pink champagne for a charity dinner tonight: its for the breast cancer organisation who have the colour pink as its main identifier. The hotel facade will be bathed in pink light tonight as a tribute. Head of Personnel for the Peninsula clearly has his work cut out and runs a successful and tight ship – managing a huge army of “personalities” with all their associated problems, keeping everyone, including guests and hotel management happy on a daily basis is quite an accomplishment. Having finished our tour of this fine hotel we are shown out by a trio of doormen “au revoir, au revoir, à la prochaine, bon voyage” the taxi is waiting, we just check our equipment and luggage is in the boot. “Yes, yes, it’s all there”, says the porter as he opens the boot with a flourish. Guess what, its empty! So even in this superbly run hotel things can sometimes go wrong. Having said that our bags and equipment were promptly located and we were off to catch our train! 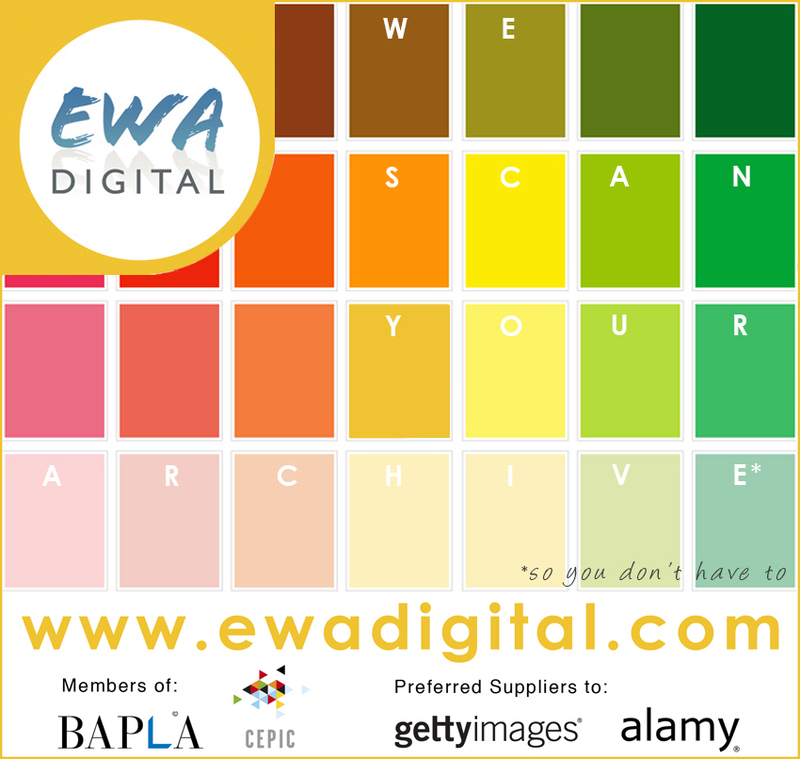 EWA is happy to be distributing selected pictures from Flora Press, Germany. 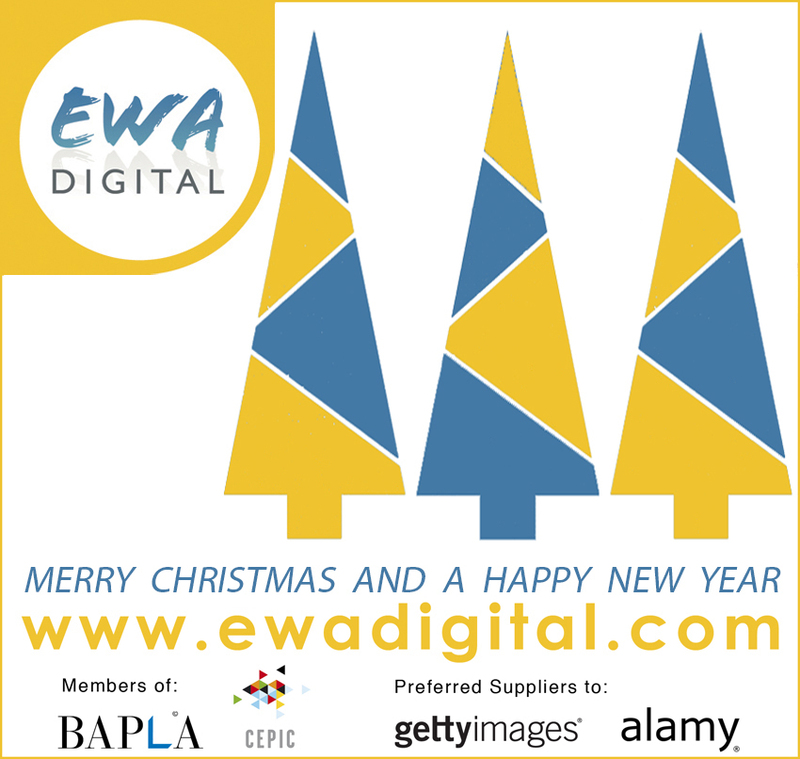 Our excellent Digital Services partners.